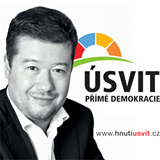 Okamura told iDnes.cz that the article is no incitement to provocations and intolerance. “We’ve discussed the text with our defense lawyers. I don’t want to step on thin ice,” he said. However, experts addressed by the Czech News Agency said the Dawn’s appeal for intolerance towards minorities has crossed a bearable limit. This entry was posted in Czech Republic, Right wing by Bob Pitt. Bookmark the permalink.